Camping is available on or near the river. Some campsites have car access while some are only accessible by raft. 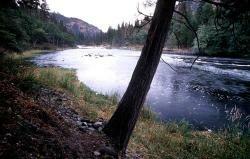 Klamath National Forest has several public campgrounds in California. The Bureau of Land Management has a few public campgrounds in Oregon. If you are planning on camping, fire permits are required. On two-day whitewater rafting trips on the Upper Klamath there are a few car access sites within the first five river miles of the trip. Head down river from the JC Boyle put-in past the BLM campsite with picnic tables and choose a site at one of the upper camps. Another option is to drive the five miles to Caldera Rapid and then go back up river to choose one of the numerous grassy beach sites. If you choose to carry all your gear down river, there are numerous wilderness camps along the river. For more information visit the BLM Lakeview District website. The Lakeview BLM District has a few developed campgrounds within 50 miles of the Upper Klamath. The Closest one is Topsy Campground. Topsy camp is located 1 mile south of Highway 66 on Topsy Road.